The Hear the World Foundation celebrated its 10th anniversary in December 2016. For this occasion, many of the over 13,000 Sonova employees worldwide raised funds as well as awareness for conscious hearing in the public. As part of the 10th anniversary, Sonova employees from 16 countries generated donations for the foundation through various fundraising activities such as cake sales, cook-offs, sweepstakes, and dart tournaments. The overall result was impressive: more than CHF 10,000 was raised. With the fundraising campaign, Sonova colleagues have once again shown just how much they can contribute to the success of the foundation. But that is only one part of the story: Up until now, more than 1,000 employees worldwide have volunteered 10,000 hours for Hear the World and have raised funds. The foundation also plans to send more Sonova employees to work on site for projects in future to reinforce knowledge transfer and thus do even more to help people help themselves in the communities. Next to the fundraising activities, 1'500 employees acted as ambassadors for the Hear the World. Under the hashtag #weareheartheworld the foundation conducted a global awareness campaign about the importance of good hearing and the consequences of hearing loss on social media. 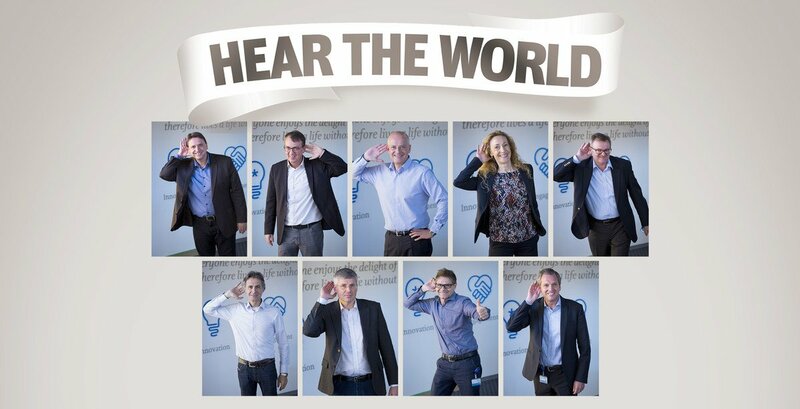 The aim was to gain as many employees as possible to take their photos in the Hear the World pose, as ambassadors for conscious hearing. For every employee who posted his/her photo using #weareheartheworld on Facebook*, Twitter, LinkedIn, Instagram, Sonova donated CHF 1 to Hear the World’s employee project in India! The campaign was very successful.